THE introduction of six direct return Qantas flights between Sydney and Dallas/Fort Worth using an Airbus A380 hopes to add capacity for visitors from one of Australia's biggest and most important source markets, according to peak national industry body, Tourism & Transport Forum. TTF Acting Chief Executive Trent Zimmerman said Qantas's announcement is great news for Australia's tourism industry. "The US is Australia's fourth largest source market for international visitors, with more than half a million arrivals in the last 12 months who spent $2.6 billion," Mr Zimmerman said. "Qantas's decision to use the A380 increases capacity on the route by more than 10 per cent and means people in more than 50 cities across the US, Canada and Mexico can fly one stop to Sydney via Dallas/Fort Worth. "This new level of connectivity makes Australia more accessible to more people and will help make Australia a more attractive destination. Mr Zimmerman went on to say that the new connection would bolster Qantas's competitiveness in the airline industry. "Qantas is also heavily involved around the world in promoting Australia as a must-see destination and this upgraded service will give fresh impetus to its marketing in the US. "Growing arrivals from key source markets like the US will help tourism fulfil its potential as an economic development strategy that can deliver future prosperity for Australia. 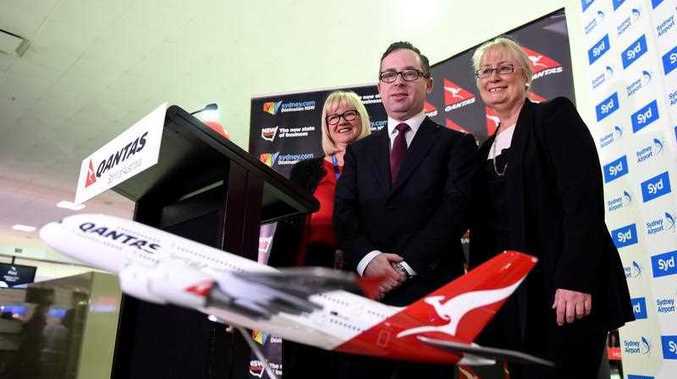 "Tourism already generates over $100 billion a year in visitor expenditure and directly employs more than 540,000 Australians, and investments like this from Qantas will help the industry reach its Tourism 2020 goal of doubling overnight visitor expenditure to $140 billion."